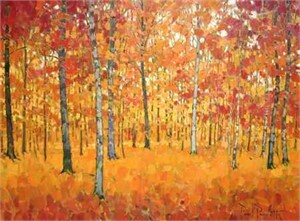 Paul Paquette was born in Cornerbrook, Newfoundland in 1962. His family moved to Montreal, Quebec in 1964, Winnipeg, Manitoba in 1970 and finally to Vancouver, British Columbia six years later. In his teens, Paul took an interest in photography, filmmaking and woodworking. 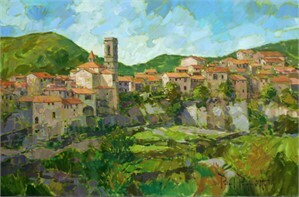 However, it was not until after his graduation from high school that he began to paint. Paul began to attend drop-in life drawing classes at the Federation of Canadian Artists. He attended regular classes and seminars given by artists such as Alan Edwards, Harry Hiene, Kiff Holland, Robert Genn, and Elizabeth Smily. 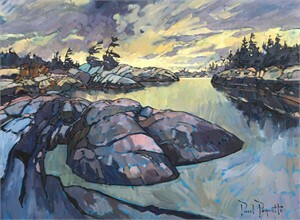 In 1985, Paul was accepted into the commercial art program at Capilano College in North Vancouver. Here, he studied to become a graphic artist – with a heavy personal emphasis on illustration. During his third year at Capilano College, Paul met and studied under Paul Degan – an excellent and inspiring teacher: “I have always felt a tremendous debt to Paul Degan. He believed in my artistic talent and pushed me back towards painting at a time when I was prepared to consign my personal art to mere hobby in favor of graphic work. I still recall how he took me into his office to critique my life drawings…after a long contemplative pause, he turned to me and said “You really have got a special talent – don’t waste it on commercial art…Paint! Paint! I believe that at that moment my future as an artist was cemented”. After completing college, Paul pursued a career as an illustrator and graphic artist, but only as much as was necessary to support himself while he developed his painting technique. Paul became a regular attendee at the Basic Inquiry Studio on Main Street in Vancouver and in the years to follow taught several classes there, including portrait painting and human anatomy. He also taught art courses for the Vancouver School Board Continuing Education Program including drawing and watercolor painting. Paul’s interest in photography had also been re-kindled while in college and in 1990 he became a founding director of the Vancouver Photographic Society and Exposure Photographic Gallery on Beatty Street. Throughout the 1990’s Paul exhibited artworks in cafes and restaurants. This brought not only public recognition and some sales, but also attracted the attention of several art agents that led to long lasting professional relationships. 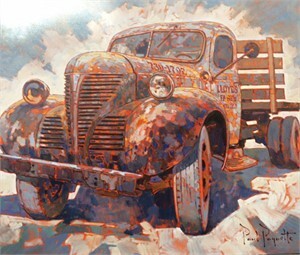 Paul Paquette was born in Cornerbrook, Newfoundland in 1962. His family moved to Montreal, Quebec in 1964, Winnipeg, Manitoba in 1970 and finally to Vancouver, British Columbia six years later. In his teens, Paul took an interest in photography, filmmaking and woodworking. 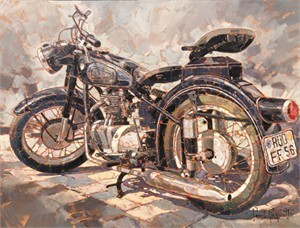 However, it was not until after his graduation from high school that he began to paint. Paul began to attend drop-in life drawing classes at the Federation of Canadian Artists. He attended regular classes and seminars given by artists such as Alan Edwards, Harry Hiene, Kiff Holland, Robert Genn, and Elizabeth Smily. In 1985, Paul was accepted into the commercial art program at Capilano College in North Vancouver. Here, he studied to become a graphic artist – with a heavy personal emphasis on illustration. During his third year at Capilano College, Paul met and studied under Paul Degan – an excellent and inspiring teacher: “I have always felt a tremendous debt to Paul Degan. He believed in my artistic talent and pushed me back towards painting at a time when I was prepared to consign my personal art to mere hobby in favor of graphic work. I still recall how he took me into his office to critique my life drawings…after a long contemplative pause, he turned to me and said “You really have got a special talent – don’t waste it on commercial art…Paint! Paint! I believe that at that moment my future as an artist was cemented”. 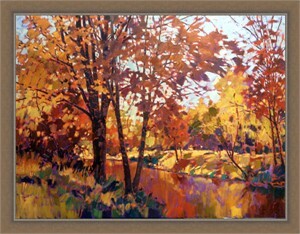 After completing college, Paul pursued a career as an illustrator and graphic artist, but only as much as was necessary to support himself while he developed his painting technique. Paul became a regular attendee at the Basic Inquiry Studio on Main Street in Vancouver and in the years to follow taught several classes there, including portrait painting and human anatomy. He also taught art courses for the Vancouver School Board Continuing Education Program including drawing and watercolor painting. Paul’s interest in photography had also been re-kindled while in college and in 1990 he became a founding director of the Vancouver Photographic Society and Exposure Photographic Gallery on Beatty Street. Throughout the 1990’s Paul exhibited artworks in cafes and restaurants. 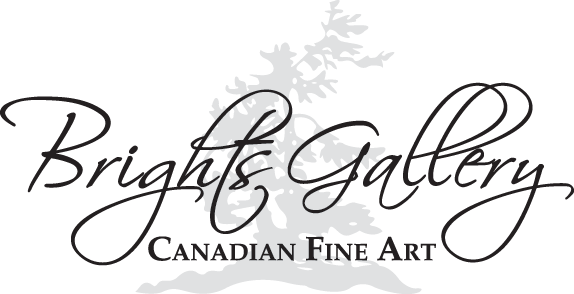 This brought not only public recognition and some sales, but also attracted the attention of several art agents that led to long lasting professional relationships.